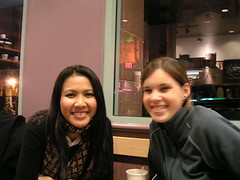 We were having dinner at a Korean restaurant on Robson St and then we went to Starbucks, where this picture was taken. posted by Magalie at 10:06 a.m.
Hi to Khajewan and Victor! May 19, 2005 1:48 a.m.
Red, Blue, Green And... Green?